Mt. 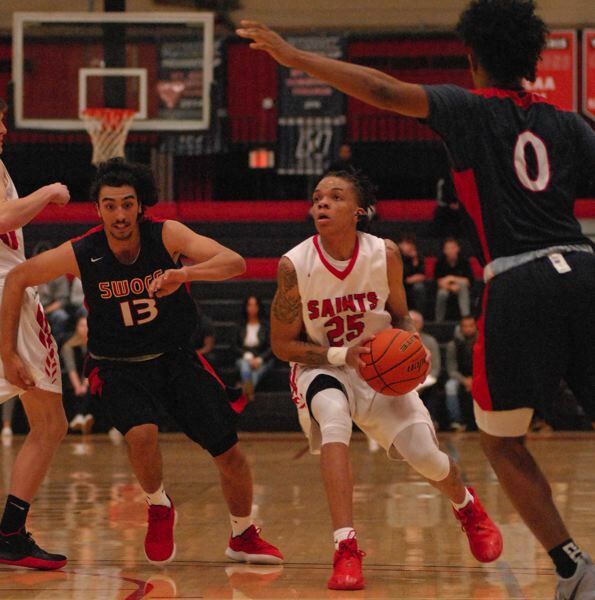 Hood Community College point guard Kahlon Whitley was relentless in his pursuit of the rim Wednesday to help the Saints to a 93-88 win over Southwestern Oregon in the South Region opener. In a game that saw 15 lead changes, the host Saints found themselves down nine points early in the second half. Whitley turned the tide with a steal that led to a free throw at the other end, followed by a 3-pointer out of the corner on the next trip downcourt. "That's how we play Down South," said Whitley, an Augusta, Ga., native. "It was my job to bring that to the team. If you don't play aggressively, you aren't going to win." Whitley put up 22 shots, many of them while crashing through the lane against taller defenders, on his way to a team-high 21 points. 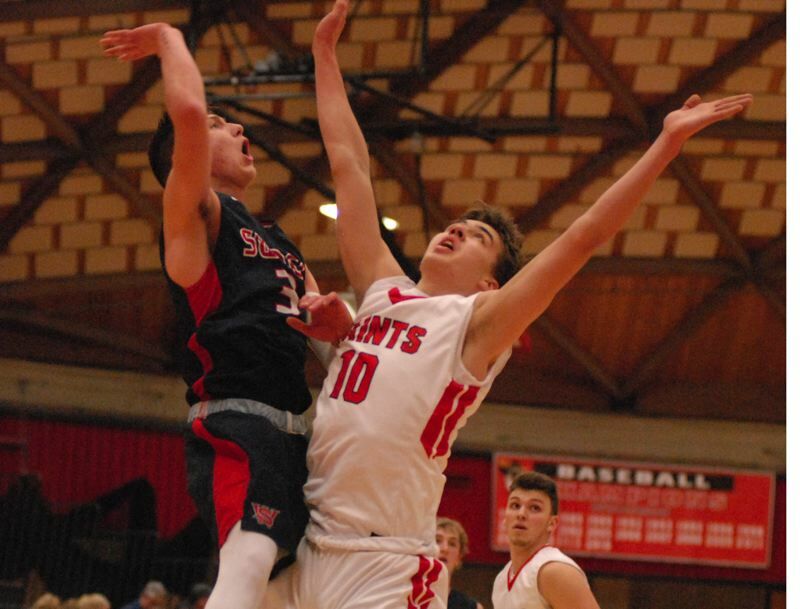 The Saints continued their comeback when Barlow High graduate Austin Forrar took three power dribbles toward the free-throw line before whipping a pass into the far corner for Marcus Greer to swish an open 3. Several trips later, Kyler Haynes, pulled up and hit an 18-footer to tie the score at 72-72. Southwest had a chance to regain the lead, but left the ball short off the front of the rim. Mt. Hood's Devin McShane was quick down the floor and slipped past a pair of defenders for a layup at the other end. Moments later, Greer forced a turnover in the backcourt, slipped into the corner and sank his third long ball of the game to put Mt. Hood in charge 84-78 with four minutes left. "At that point, we gotta win," Greer said. "There was a loose ball and I gotta get it — there were no other options." 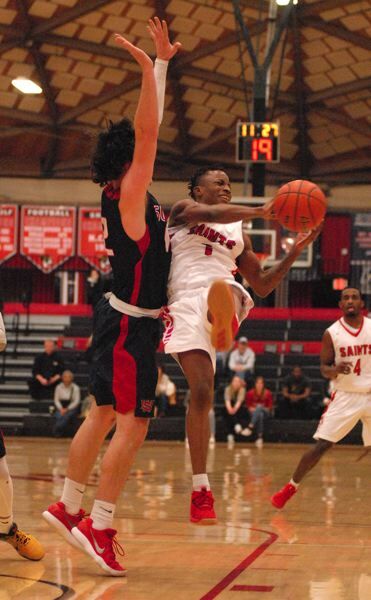 The Saints missed a series of layups over the next few minutes that would have put the game out of reach, but SW Oregon could not find the bucket at its end either. Mt. Hood maintained some breathing room on a 3 by Carter Arrasmith for a 92-87 lead as the clock ticked under a minute. SW Oregon's starting five combined to shoot 3 for 18 (.167) from behind the arc. Mt. Hood (7-6) hosts Umpqua at 4 p.m. Saturday. The Saints held the upper hand early when Haynes tipped a pass loose and fired the ball ahead to Whitley for a layup. Several possessions later, Forrar fed the ball inside to Peter Nelson, then slipped into the corner as if to set up for a 3-point try. Instead, he broke along the baseline and got the ball back from Nelson for a layup and a 21-17 lead. The Lakers erased a six-point deficit in the final minutes of the first half with Moses Miller converting a three-point play on a fast break, then dribbling down the clock before finding Ransford Ntow Jr., for an open 3 at the horn that sent SW Oregon into the locker room up one point. SW Oregon (88) — Moses Miller 23, Keenan Reynolds 14, Connor Sailors 12, Jake Gomez 10, Koby Etzwiler 8, Tanner Lewis 6, Aaron Sanchez 6, Carson Washburn 4, Ransford Ntow Jr. 3, Saviors. Mt. Hood (93) — Kahlon Whitley 21, Carter Arrasmith 18, Devin McShane 17, Marcus Greer 12, Vlad Katin 10, Kyler Haynes 7, Peter Nelson 4, Taylor Howard 2, Austin Forrar 2, Farmer, Hall. This story is slated for our Friday, Jan. 4, print edition.